The meniscus is a C-shaped piece of cartilage next to the knee that acts as a shock absorber. A meniscus tear is a common injury of the knee joint that occurs from trauma such as a forceful twisting of the knee joint or degeneration over time. 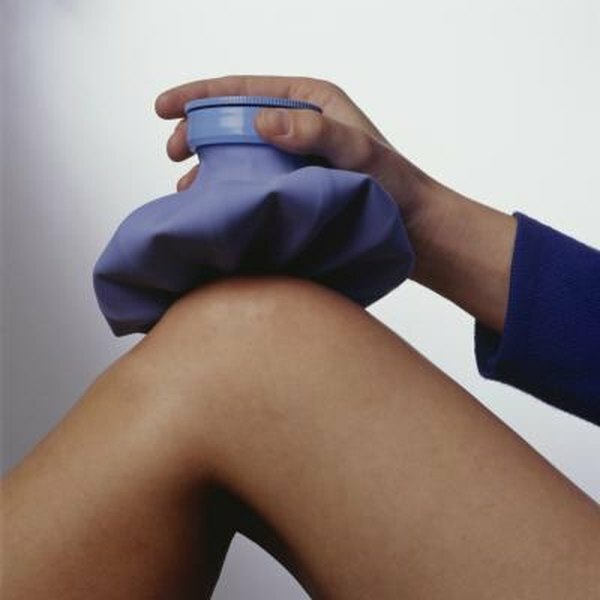 Exercises that strengthen the muscles and tendons around the knee help to heal a meniscus tear. Speak with your doctor about which exercises are best for you if you've torn a meniscus. Exercises that target the quadriceps -- such as isometric contractions, straight leg raises, knee extensions, squatting and short-arc extensions -- help to strengthen the meniscus. The quadriceps are the front thigh muscles. Quadriceps isometric contractions and knee extensions are two of the first exercises you perform in rehab because of the minimal load on the knee joint. An isometric contraction is simply tightening your quads while the leg is straight, without moving the knee joint. You can do this sitting up straight on the floor and pressing the back of your knee into the floor for five seconds. Exercises to strengthen the hamstrings on the back of the thighs also strengthen the meniscus with opposite movements done for quadriceps exercises. This is because the hamstrings are on the opposite area of the thigh from the quads and move the knee and hips in the opposite directions. Exercises for the hamstrings that strengthen the meniscus include hamstring isometric contractions, static hamstring holds, leg curls and hip raises. The static hamstring hold is one of the first exercises you can perform after a meniscus injury. To perform this exercise, lie face down and bend your injured knee to 45 degrees off the floor. Hold for 10 seconds, then lower the leg to the floor. Balance exercises not only improve meniscus strength, but also your body's ability to sense where it is in relation to space. This is known as proprioception. Standing on one leg is a classic balance exercise, but a modern tool called a wobble board challenges your balance further. A wobble board tips side to side like a seesaw, so the challenge is to keep it level. Begin by attempting to stand on the board with both feet. Once you can do that, progress to standing on the center of the board on your injured leg. Stationary cycling on an exercise bike improves the ability of the meniscus to tolerate exercise. Use little to no resistance when cycling so you do not overdo it. Begin with a 15-minute workout and gradually extend your cycling time to 30 minutes. Because the calf muscles connect to the knee, performing calf raises can strengthen the meniscus. Simply stand with your heels hanging over the edge of a stair and rise up onto your toes to perform calf raises. Start with both legs and progress to doing single-leg calf raises on your injured leg.